"German auto manufacturer is rumored to be working on a new 800cc super scooter for release in 2010. The big new Beemer scooter will feature fuel-injected Rotax v-twin engines in three sizes: 500cc, 650cc, and the big 800cc model. Horsepower will range from 33 to 70. The new big bikes will employ counter-rotating crankshafts to minimize vibrations, and will also feature CVT transmission. Recent trends in scooter have been leaning towards larger models with more and more power, along with sporty, futuristic designs. Several manufacturers have had huge recent success the double front wheeled trikes that have engine capacity upwards of 500ccs. As scooters increase in popularity in the U.S. market (due in large part to problems in the auto industry and volatility in fuel prices) look for more foreign luxury makers to come up with prototypes and new models that cash in on the American taste for luxury and speed. BMW has never been one to skimp on either of those qualities." Jag väntar med spänning på vad Suzuki har på gång, en större motor måste det bli!! Kul att det kommer modeller som både har större motor och som ser sportigare ut. Lockar nog nya köpare. Scootrar har väl fortfarande en töntstämpel i Sverige, men med sådana här modeller kommer den säkert att minska. Kul! Based out of Austin, Texas, KLD Energy Technologies is another start up looking to make it big in the burgeoning electric vehicle industry. The firm’s lithium-powered electric propulsion motor is slated to debut in the Neue scooter line, which will feature two models, the E-140 and E-165 - the latter claiming a remarkable 65 mph top speed. Den hade en klart cool design. GO company has released electric scooter called e-BuBu for the Asian market. This is the first model of a two-device company with an electric motor. BuBu based on the American electric scooter Genuine Buddy, is fitted to both wheels and disc brakes both front and rear. Maximum speed - 60 km / h.
Removable lithium battery is located at the rear of the scooter under the seat. Den hade en trevlig lösning på batteripacket. Eftersom jag är lite förtjust i småskotrar. SEPTEMBER 29, 2009, 12:30 P.M.
Vectrix Corp. has filed for Chapter 11 bankruptcy with a $5 million offer for its assets, subject to higher bids at an auction the electric scooter company wants to hold next month. The New Bedford, Mass., company, is seeking an Oct. 29 auction, warning that it would "quickly run out of money" if a sale of its assets isn't closed quickly. Investment and financial advisory firm GH Venture Partners LLC and a unit of battery maker Gold Peak Industries (Holdings) Ltd. have teamed up to offer the leading $5 million bid, which includes $1.75 million in cash and up to $3.3 million in liabilities. The joint venture, through a company called New Vectrix LLC, is also offering Vectrix a $300,000 bankruptcy loan to help the company cover the costs of its bankruptcy and operations. Vectrix said the loan will help it ensure it can continue operating its business until a sale closes. Vectrix is proposing to put most of its assets on the block, including the patents, trademarks and licenses associated with the high-performance, zero-emission electric scooters it designs and sells. Also up for grabs are the Vectrix's shares in its European subsidiary. Under Vectrix's auction proposal, which is subject to bankruptcy court approval, New Vectrix is slated to receive a $125,000 break-up fee if its bid loses at auction. The auction timeline calls for rival bidders to submit their offers by Oct. 27, exceeding New Vectrix's bid by at least $500,000. The company is asking the bankruptcy court to consider signing off on the sale by Oct. 30. Founded in 1996, Vectrix initially began developing the technology it uses in its scooters, relying on equity financing to fund those efforts. Commercial production began in 2007, but the company lost money on sales of its scooters and continued to rely on equity financing for working capital. While Vectrix boosted its sales in 2008, it found itself facing "a significant lack of working capital" as the capital markets seized up and sales declined. For the rest of the year and into this year, Vectrix said banks were "reluctant" to fund an emerging company like itself, and financing for green technology companies "disappeared." As the company sought a buyer or merger partner, it also engaged in such cost-cutting measures as laying off all but essential staff. The company also ceased making payments to its board of directors as of January and to its president and chief executive as of July. In the Chapter 11 petition that Vectrix filed Monday with the U.S. Bankruptcy Court in Wilmington, Del., the company reported assets and debts in the range of $10 million to $50 million. Given its reliance on equity financing, Vectrix said it has little secured debt. The majority of its debt is unsecured, which Vectrix currently pegs at $26 million. Vectrix's Chapter 11 proceeding, numbered 09-13347, has been assigned to Judge Kevin Gross. Trist, men man får anta att företaget/produkterna fortsätter i någon form. Says BMW, "This is what a safe, environment-friendly and highly practical single track vehicle for city traffic could look like in the future." Well then, let's dissect that statement and see how BMW sought to accomplish these seemingly contradictory goals. First, safety. Between 2000 and 2003, BMW offered a scooter in Europe called the C1. Though a marketplace failure, that machine may still be the safest two-wheeler ever offered. Featuring a fully-enclosed cabin with integrated rollover protection, a front-end impact zone, a rider seat belt and a low center of gravity, the C1-E has safety baked right in from the start. To that package, BMW adds electronic aids that include Integral ABS, Tire Pressure Control, Anti-Slip Control and Traction Control. So... safety? Check. Environmentally-friendly? 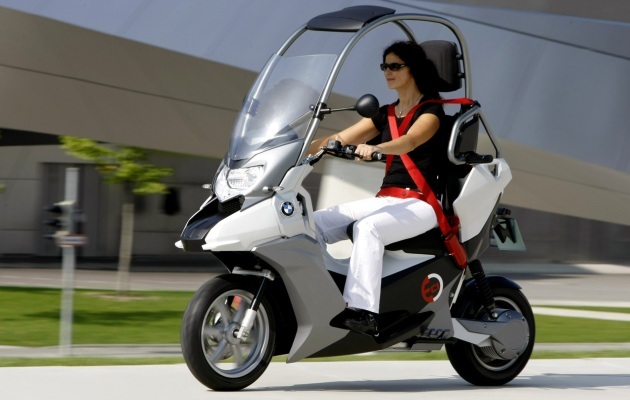 The scooter itself emits nothing – BMW borrowed the electric motor and control systems from electric scooter manufacturer Vectrix (which recently filed for bankruptcy). Vectrix's battery pack, though, has been swapped out with a high-tech lithium ion unit for greater energy storage. Alternatively, BMW could equip the same basic platform with any electric motor or small internal combustion engine of its choice. So, check. Kul om den kommer i produktion. Designed by the Style Centre of Pontedera, directed by Marco Lambri, Piaggio USB takes our references beyond the boundaries of existing categories, combining ecology, pleasure, safety and connectivity to give shape to an original and innovative, two-wheeled mobility proposal for the third millennium. Piaggio has always stood for innovation on two wheels. This has been the case ever since Corradino D’Ascanio’s intuitive spirit who, more than sixty years ago, created the scooter par excellence – the Vespa - a bestseller whose philosophy of construction and use has been reinterpreted by different models, such as Beverly, up to the most technological scooter - MP3 Hybrid - the first scooter incorporating a parallel hybrid propulsion system, with three wheeled technology and Ride By Wire accelerator. In line with this tradition, Piaggio has now developed Piaggio USB (Urban Sport Bike), a prototype that represents the synthesis and, at the same time, the potential evolution of the idea of urban mobility on two wheels. It is designed to offer an innovative solution where environmental protection, safety, fun driving and connectivity become the key to the cities of the future. A hybrid of shapes, technologies, motor vehicle architecture: Piaggio USB breaks the mould and stands as a new species in the metropolitan scenario of the future. 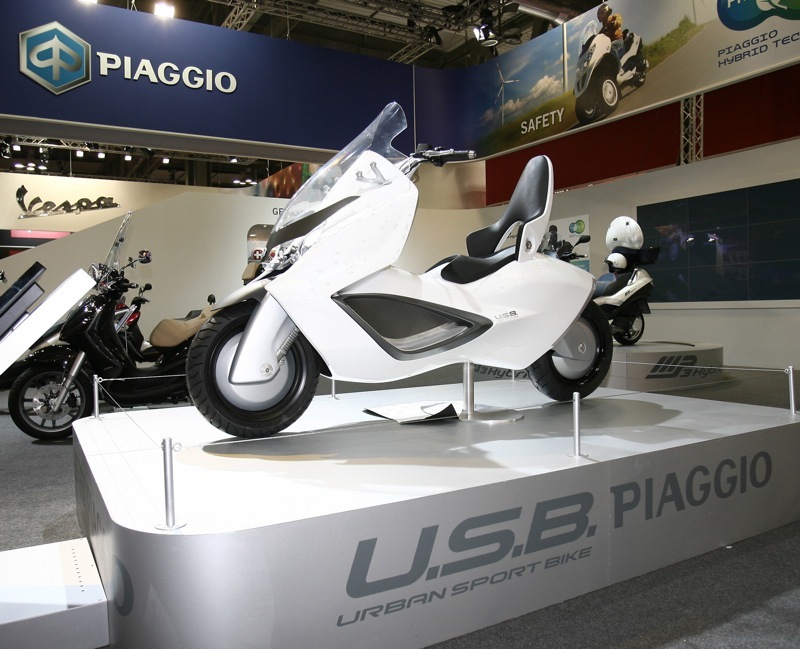 In a world where the range of vehicles is constantly changing, Piaggio USB draws inspiration from the scooter, motorcycle and car world. Its design, whose distinguishing feature is its pure and sinuous shape, draws from worlds that are not the ones that are conventionally referred to for two-wheeled scooters. Its enveloping shape turns the scooter driver into the protagonist and conceals what is superfluous. Man is once again the centre of attention and the vehicle becomes a modern instrument to move SMARTLY in all conditions. The benefits of innovative ergonomics, scooter-typical protection and convenience are combined with motorcycle dynamism. Rationality and excitement merge into fluid and dynamic shapes. Piaggio USB is incredibly sinuous and its smooth surfaces make it a quick, dynamic scooter, ready to take over any road. Easy and intuitive, light and compact, Piaggio USB is designed to offer the convenience of a scooter and the comfort of a compact car, without giving up sporty and fun driving. Utmost comfort is guaranteed by its highly protective surfaces, ensuing from a smooth and aerodynamic design, and by its ergonomic seat, an innovative position that is halfway between a scooter and a car. The prototype can develop into three different configurations: single-seater, like a sporty vehicle, two-seater like a coupé, or with top-box, for the highest load capacity. Innovation and distinction, in line with Piaggio’s outstanding tradition, both in its design and technology. The propulsion is guaranteed by a power-pack made up of an evolved 2T GDI heat engine, coupled with an innovative electric machine installed in the back wheel. The electric propulsion makes the most of the innovative quality of nanotechnologies, thus offering top performances and top reliability. The series hybrid configuration, with plug-in option, has been devised to ensure an average speed of use of 60 Km/h, and an over 100 Km/h maximum speed. For the electric propulsion only, the 2.5 Kw/h lithium-polymer batteries installed in the vehicle guarantee a 50 Km endurance at a cruising speed of 60 Km/h. In performance terms, the power pack stands out for its high torque values – around 200 Nm – that guarantee excellent acceleration and very low consumption – around 1.5 l every 100 Km. By making the most of the plug-in option, the vehicle turns into a ZEV (Zero Emission Vehicle). Its weight – less than 130 Kg – its high torque values and its low centre of gravity make Piaggio USB an easy and fun-to-drive, other than an eco-friendly vehicle. June 8th, 2009 - Imagine a new, better looking T-Max that puts out even more power than the current 500cc model. Rumors keep reemerging that Yamaha will introduce a new 3 cylinder T-Max with a displacement of 750cc. Apparently the T-Max 500 already has a dummy cylinder and rod that is currently used to counter balance engine vibration. It appears the plan is the utilize the extra cylinder and rod with a real piston to bump the displacement to 750cc. Although nothing has been officially announced by Yamaha, it seems like this would be a easy way to compete power-wise with the newest maxi supersport scooter to hit the market, the Gilera GP800. If this model is getting ready to be launced for the 2010 year, expect an announcement from Yamaha sometime in the Fall of 2009. If the US does end up getting the T-Max 750, I would imagine that it won't arrive here until the 2011 or 2012 model year. Stay tuned for all of the latest updates on the new Yamaha T-Max 750cc maxi sport scooter. Kikade på den nya X-Max 250 på Yamahas hemsida. Innan -10 lanserades låg rekommenderat nypris för en -09 på 42.900:-. Nu är priset 45.900:- för en -09! En -10 ska kosta 49.900:-. En gammal modell har alltså blivit 3.000:- dyrare och den nya är totalt 7.000:- dyrare. Undrar hur de försvarar det. Sidan skapades på 0.438 sekunder med 21 databasfrågor.